Going to a relaxing zone in a natural park such as the river, waterfall, lake of garden with virtual reality and doing relaxing exercises supported by a relaxing narrative effectively reduces stress and anxiety. Virtual reality showed better improvements than video or audio although the latter two also reduced stress and anxiety. We found a significant difference between the three conditions and an interaction effect between time and condition for participant’s ability to reduce their heart rate (HR). Specifically, participants in the VR condition were better at reducing their HR and significantly improved their emotional state during experimental sessions as well as the follow-up sessions. About the anxiety subjective self-report scores, we found a significant difference between groups and in particular Video condition achieved better results, compared to VR and Audio groups. This could be a new way for mental health care to provide easily accessible and cost effective services. Virtual Psychiatric Ward Helpful for New Admissions? Most patients are admitted to our ward by direct referral from the psychiatric emergency service, a service delivered by Community Mental Health Centers. Some are referred by our own out patient clinic, often these patients are shown around the ward before admission but these patients are the exception to the rule of acute admittance. Most patients are without prior knowledge of the ward or even the slightest idea about psychiatric wards, mostly scary imaginations from movies and such. Misconceptions about these wards, however, are so prevalent that patients, especially those newly admitted to a ward for the first time, are anxious and become reluctant or even refuse to receive in-patient psychiatric management. Wouldn’t it be great to let future first time patients have a look around the ward in virtual reality? Recent research looked at virtual reality as a way of reducing anxiety for first time patients going to be admitted to a psychiatric ward and how good is virtual reality in raising the level of understanding of the new environment. They made a virtual ward for a virtual guided tour that led the patients to different rooms and locations. The patients had to preform certain interactions on the computer with visual and audio feedback before they could move to the next location. Most of the feedback was on rules and regulations on the ward and about procedures and their explanation such as the need for locked doors. Interaction was with keyboard and mouse. Admitted patients giving informed consent were randomly assigned to the virtual reality group (n=27) or to a non virtual reality group (n=27). Patients in the latter group were allowed to read the information on rules and regulations from a computer screen. All patients were monitored with heart rate variability measurement, State Trait Anxiety Inventory and a test for their level of understanding of the information offered. Patients did not differ on anxiety as measured with the heart rate variability but they did differ between groups on the State Trait Anxiety score. Physiologically their anxiety on admission was not reduced by the virtual reality introduction but the participants did find the new approach with virtual reality very helpful to orientate them in the new environment. This study was done in China, with only females included in the two small groups, randomization was not double blinded, and severe mental illness was an exclusion criterion. To me this procedure looks promising, what do you think? Oregon State Hospital – The largest, oldest, and most famous structure within the institution is the J Building, built in 1883. This building. The Oregon State Government wanted to demolish the J Building in 1988 due to life-threatening health and safety dangers posed to patients and staff. There is an abundance of lead-based paint and asbestos throughout the building. Presently, the J Building is on the brink of collapse and mostly abandoned. Patients continue to be held in remodeled portions, but many believe that a minor earthquake could send the dilapidated structure and patients to their demise. Three fast track articles were recently published on CyberPsychology and Behavior about the treatment of PTSD with virtual reality exposure therapy. Exposure therapy is the most evidence based treatment for Post Traumatic Stress Disorder (PTSD). More than 18 studies have been published on the use of virtual reality exposure treatment for PTSD. One of the articles is a case series of treatment with virtual reality exposure treatment within the combat theater. Until now this treatment was done at home. In this article a portable set of virtual reality machines was take to Iraq for treatment of PTSD within the combat theater, at the front in Fallujah in Iraq. Camp Fallujah was a Marine base located outside the city of Fallujah. The virtual reality was compared to traditional exposure therapy. This study is the retrospective review of cases, not a randomized prospective controlled trial. How is Virtual Reality (VR) done? Six patients were treated with VR, four patients with traditional ET. Both treatments were efficacious and there was no significant difference between the two treatments. Moreover, both treatments also equally improved depressive and anxiety symptoms. This work shows that patients with combat PTSD can be successfully treated with ETs while in a combat theater. Another article is about a VR adaptive display called EMMA’s World. It allows a therapist to customize clinically significant environments for each participant, which can vary according to the significance of the trauma for the individual; this is in contrast to other therapeutic VR approaches that focus on simulating the physical characteristics of the traumatic event with high realism. Rather than aiming for realism, EMMA’s World employs customized symbols and personalized aspects to evoke emotional reactions in participants. They compared cognitive behavioral therapy with cognitive behavioral therapy and augmentation with EMMA’s World. 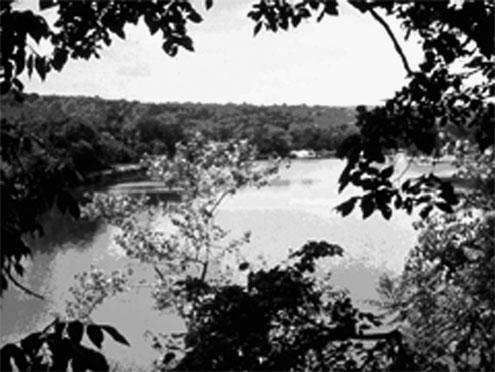 Participants were randomly assigned to the two conditions and treatment lasted 9-12 weeks. The treatments didn’t differ in efficacy. The third publication is a clinical controlled pilot study. Ten patients were assigned to 3 groups: VR with exposure therapy, exposure in imagination and a waiting list group. The group consisted of 10 elderly war veterans with chronic PTSD in Portugal. In this study VRET also shows promising results, also on depressive and anxiety symptoms. So it’s time for some larger, prospective double blind randomized studies on VR exposure therapy and the golden standard traditional exposure therapy. The latest multi-core processors and some smart software allow techniques used by physicists and engineers to simulate the real world in extreme detail to be used to create virtual worlds governed by real physics, rather than the simplified versions used today. The video above shows how the results are streets ahead of the standard graphics of today. One expert evens predicts that such techniques could be used to create Matrix-like virtual worlds indistinguishable from reality within just a few years. Civilians can be exposed to traumatic events. Most notably terrorist bombing attacks. In Israel, civilians are a frequent target of terrorist suicide bombers (e.g., attacks on civilians riding on public buses). BusWorld is a simulation of a terrorist suicide bus-bombing attack designed to treat survivors for PTSD. Patients with PTSD commonly have persistent traumatic thoughts, memories, or nightmares about the traumatic event; typically avoid thinking about the traumatic event; feel emotionally numb; and show social avoidance (e.g., avoid riding buses). Other common symptoms include recurring flashbacks, irritability, anger and rage, hypervigilance, bodily discomforts, and trouble sleeping. In a recent publication this form of Virtual Reality Exposure Therapy was tested on 30 healthy volunteers without PTSD. The objective of the present study was to measure the amount of anxiety elicited in nonsymptomatic adults in response to four progressively more intense levels of the BusWorld simulation toward the eventual use with people who have witnessed and survived a terrorist bus-bombing attack and developed PTSD. What is Virtual Reality Exposure Therapy? In Virtual Reality Exposure therapy, patients go into an immersive computer-generated environment (go back to the scene of the traumatic event) to help them gain access to their memories of the traumatic event, change unhealthy thought patterns, gradually habituate to their anxiety, and reduce the intensity of associated emotions. The therapist’s ability to manipulate the amount of anxiety experienced by the client during therapy is an important element of successful exposure therapy. The therapist controls the severity of the scenario in the VRE therapy via the pressing of different function keys. The VR was programmed to have 4 levels of intensity. This way the participants and future PTSD patients can be exposed to graded exposure with 4 increasing levels of distress. A bus appears and approaches the bus stop, but there is no explosion. 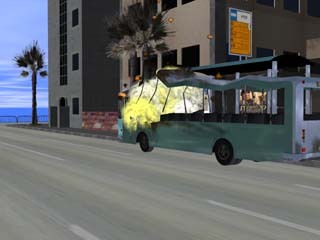 The bus arrives at the bus stop and explodes; the bus is seen to be burning, there is smoke and shattered glass on the street, but there are no accompanying sound effects. This level is the same as Level 3, except with the addition of sounds of the bus exploding, people screaming and crying, as well as police sirens and reflections of flashing police-car lights (police car is not visible to participants) but in this level it is clear to see that there has already been some victims injured in a car accident. In this study with healthy participants the level of distress increased with each level. This suggests that BusWorld may prove to be a valuable medium for providing graded exposure for individuals suffering from PTSD originating from suicide bus bombings. a graded immersive simulation of the events of September 11, 2001, at the World Trade Center in Manhattan. This has been studied in a controlled trial with a waiting list group. The VRE was more efficacious in reducing PTSD symptoms. 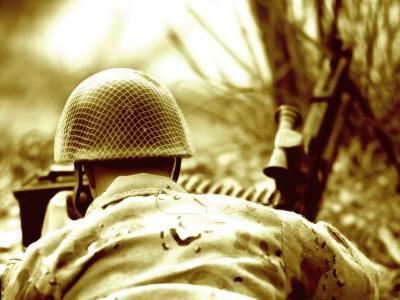 In a recent article in British Medical Journal it is concluded that an association was found between deployment for more than a year in the past three years and mental health that might be explained by exposure to combat. In other words: Personnel who were deployed for 13 months or more in the past three years were more likely to fulfil the criteria for post-traumatic stress disorder, scored worse on the general health questionnaire, and have multiple physical symptoms. PTSD is frequent among soldiers exposed to combat. This has been studied in an open trial with good efficacy for PTSD. A recent study utilized a survey-based approach to examine pre- and post-deployed Soldiers’ knowledge of and attitudes toward using technology to access mental health care. This study examined 352 U.S. Soldiers’ knowledge of and attitudes toward using technology to access mental health care. Results indicated that Soldiers were quite experienced with a wide variety of technology-based tools commonly proposed to facilitate mental health care. In addition, the majority of participants stated that they would be willing to use nearly every technology-based approach for mental health care included in the survey. Notably, 33% of Soldiers who were not willing to talk to a counselor in person were willing to utilize at least one of the technologies for mental health care. This is especially important since soldiers often face unique barriers to care, including geographic location, deployment, complex duty environments, and fear of treatment stigma, and may not access the mental health care services they need.